Introductory Children’s Classes (Ages 7-12): How do you know if karate is really for your child? Does it really build confidence and self esteem? How do you know if it will be as good as you’ve heard from other parents? The answers to these questions and many others will become obvious when you enroll your child in the Introductory Children’s Karate Class. INTRO Classes happen every 2 months and allow novice students to experience the fun and structure the martial arts has delivered to its students throughout history. 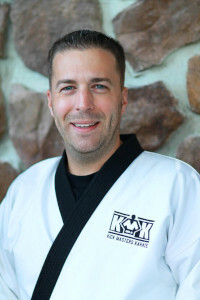 The INTRO Class meets once a week for a five-week period to introduce students and parents to the core values and benefits of Tae Kwon Do at Kick Masters. Students participate in five, highly structured classes, which introduce physical aspects of karate such as flexibility, balance, strength, focus, mobility, and endurance. At the same time, the INTRO Class will begin to lay the foundation for a child to become more patient, disciplined, respectful, humble, honest, and highly motivated, yet grounded at the same time. Why not enroll your children in a program which will transform them into the leaders of their classrooms? Why not enroll them in an activity which will make them positive trend setters in their peer groups and physical standouts in the various other sports in which they may already be involved? Why not teach them the value of responsibility and commitment, while instilling honor and confidence? Enrollment into this program is ongoing, so make sure you sign your child up as soon as possible to ensure a spot in the next INTRO Class. *See schedule to see when the next INTRO Class is taking place. Remember to inquire early as space is limited. Traditional Mainstream Classes for Children (Ages 7-12): Our traditional children’s karate classes include ranks white through Black Belt and are offered at various times per week. Beginning children lay their martial arts foundations two to three times per week, to ensure a successful, and long lasting martial arts career at Kick Masters. Advanced students may train diligently three to four times per week through various programs, and have access to classes such as weaponry, sparring, self-defense, private lessons and many others. Brown and Black Belt students at Kick Masters train 7-days a week, and are considered by some to be “professional athletes.” Participants are invited into these age and rank specific classes upon completion of the Children’s INTRO Class. Nolan was in a situation recently where his friend was being physically picked on by an older boy. His friend allowed it to continue because he was afraid to "tattle". As the situation escalated, Nolan took it upon himself to stand up, move in between the older child and his friend and separated what was happening. The older boy immediately lost interest in "picking on" Nolan's friend and turned his attention elsewhere. That day, Nolan displayed courage, boldness and leadership in ways that we could have never dreamed would come from our once shy, "crowd follower" little boy. Our son is a different kid because of what he's learned at Kick Masters. Our entire family is different for that matter! Thank you!